The console has several color themes that you can select. Select a theme from the Theme drop-down list in the console toolbar. 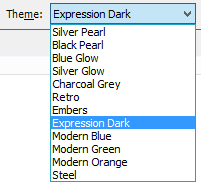 The default is "Expression Dark." Try some of the other options if you want something else. You can only select from the list of available themes. You can't customize an existing theme or create your own.